Considering how much Kurt Cobain loathed the fame and adulation showered upon his own band, you can only imagine the depths of hatred he would have harbored for the latter-day jocks who jacked his style and sound, shearing both of any measure of subtlety or meaning and using the resultant pseudo-grunge bilge to catapult themselves to global stardom. 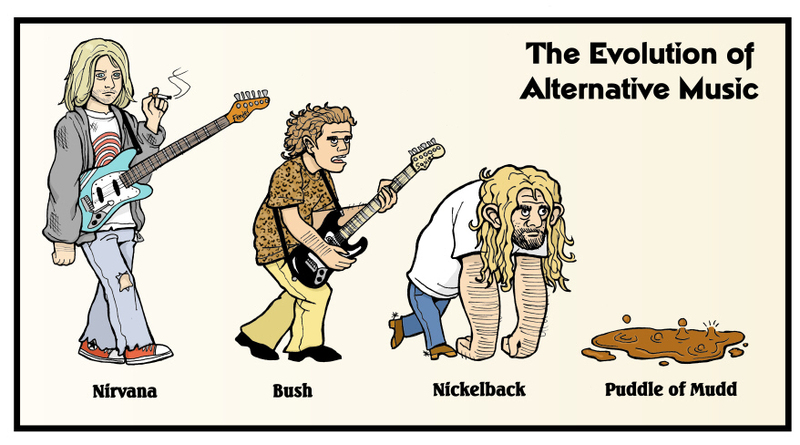 (See here for a convenient summary of the genre’s post-Nirvana devolution.) Given that there’s a full-fledged grunge revival happening these days, we can only hope neo-grunge doesn’t eventually spawn neo-Puddle of Mudd.